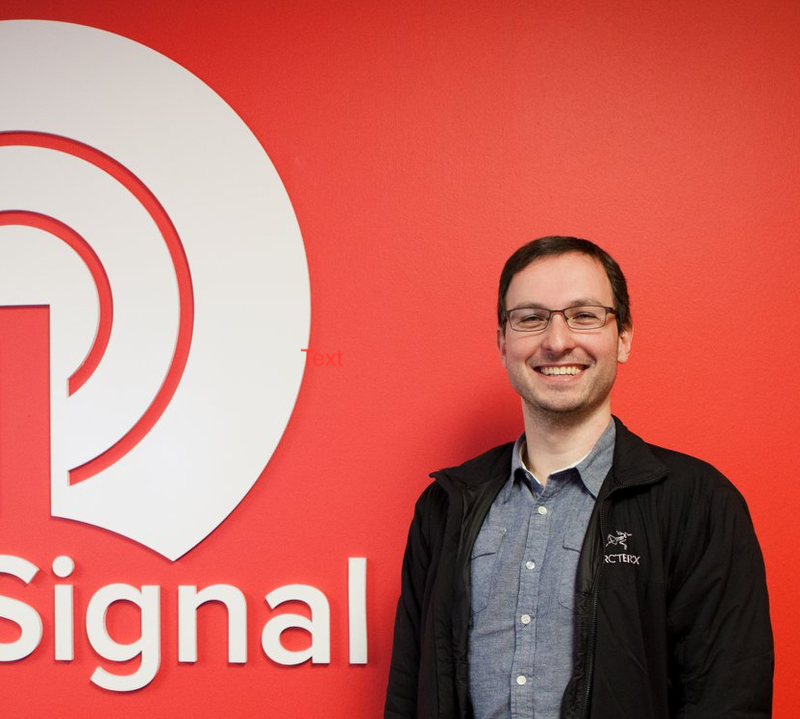 One of our goals at OneSignal is to help our clients take advantage of the latest platform features as soon as they're introduced in iOS, Android, and Web Push. Today we are excited to release an iOS 12 Beta SDK update that you can use to start testing out the new notification features that will be released as part of iOS 12.
iOS 12 is introducing a new authorization model known as Direct To History (also known as 'provisional' authorization). If enabled, your app will be able to send push notifications to your users without ever presenting the iOS push notification permission prompt. Direct To History notifications will be sent directly to the Notification Center (which Apple now calls 'History'). The user will not be prompted or alerted by these notifications in any way, and they will not show up on the lock screen. 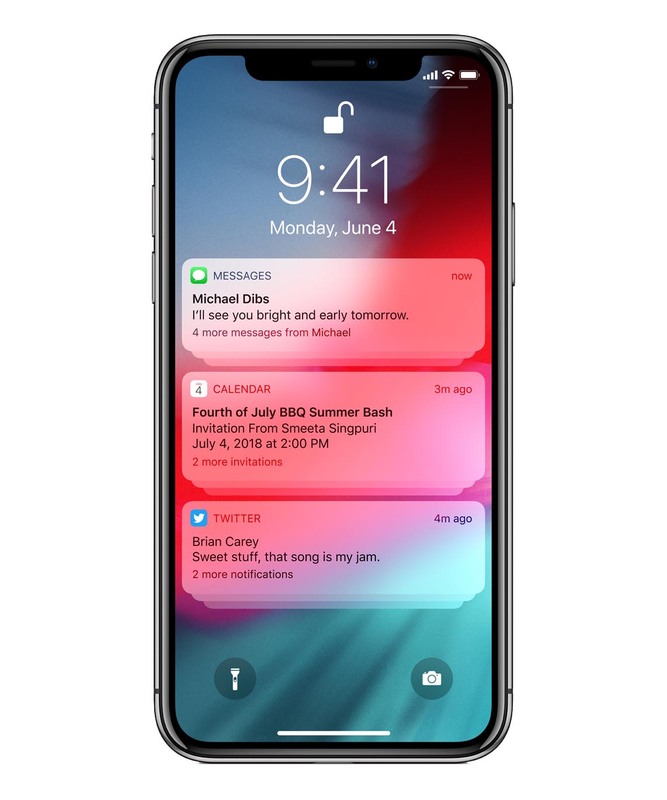 The user will have to either swipe down on the home screen or, on the lock screen, swipe upwards to view the Notification Center. Your app can have both traditional and Direct To History authorization models. When a user first launches your app, our SDK can immediately get Direct To History authorization, and your app can request traditional permission at some later point in response to a specific user action. Once a user sees a direct-to-history notification, they will be given the option to continue receiving notifications from your app or disable them entirely. 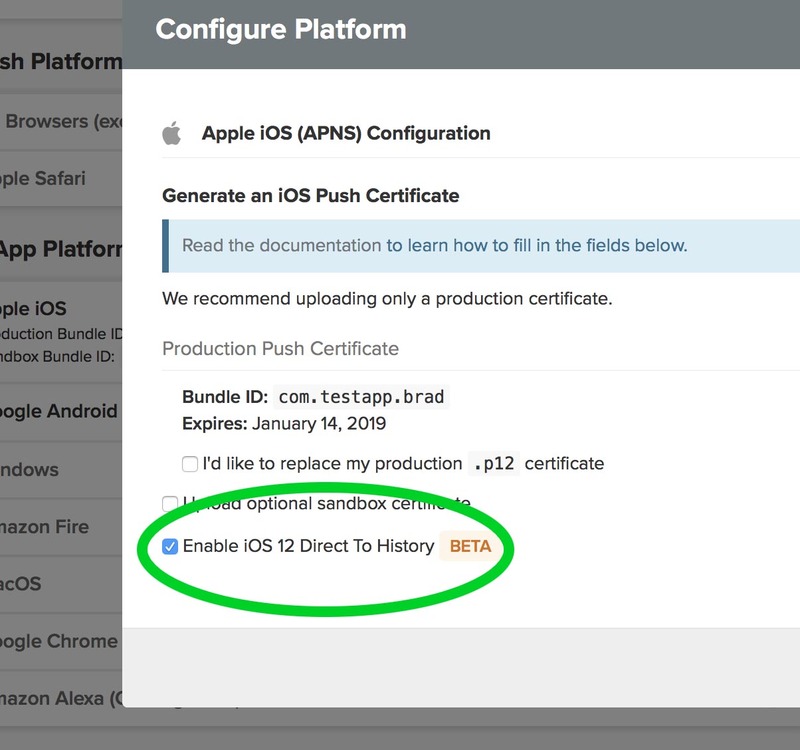 Our Beta SDK introduces support for this Direct To History authorization model, making it as easy as possible for your app to take advantage of it. There are two steps to begin testing Direct To History push notifications in your app with OneSignal. First, download our Beta SDK by following these instructions. After installing the beta SDK, log in to the OneSignal Dashboard, and enable Direct To History in the iOS platform settings. This will authorize all users for Direct To History push notifications the first time they launch your app. Note: Even after a user is authorized for direct to history notifications, you can still show the traditional Notification Permission prompt to get full authorization if you choose to at a later point. If you prefer not to enable direct-to-history for all users when they first launch your app, you can ignore this setting and programmatically call OneSignal.registerForProvisionalAuthorization() with our SDK. Once a user opens Notification Center, they can respond to your Direct To History notifications in two ways. 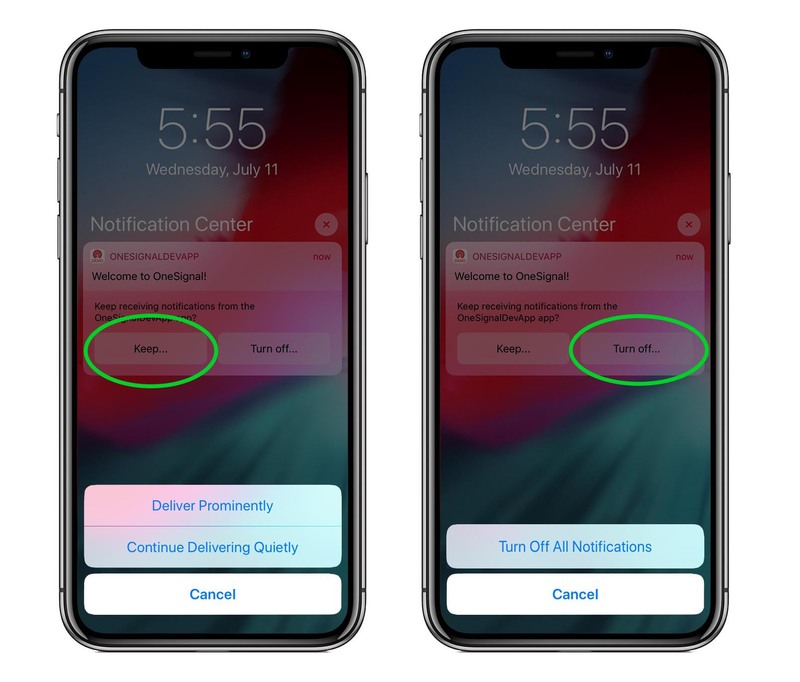 They can select Keep to give your app full notifications permission; they can either choose to Deliver Prominently (which will include a traditional alert/banner), or they can choose Continue Delivering Quietly, which means your notifications will continue being sent directly to Notification Center without alerting the user. 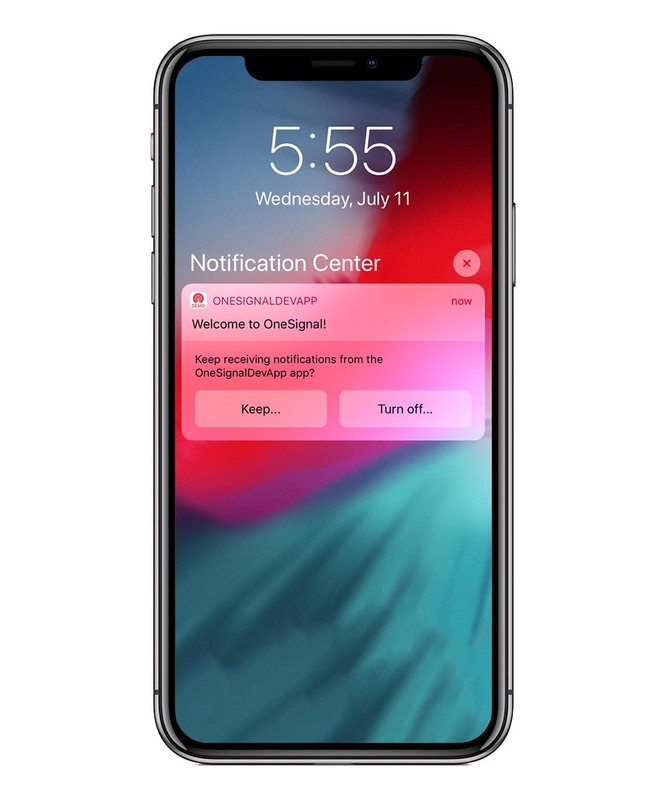 Because these notifications will not alert the user in any way, these notifications will likely see a lower CTR (click-through rate) compared to traditional push notifications. Apple recommends using this model for apps that don't need to alert the user to something important that would require timely response. It is your decision to decide if direct to history push notifications will benefit your app and company. Also, keep in mind, Apple strongly recommends that in order to increase CTR, make sure your push notifications are more than an empty invitation to open your app. iOS 12 also introduces Notification Grouping, which allows you to determine how push notifications for your app should be grouped together. In order to use grouped notifications with our API, you can set the thread-id parameter of the notification. iOS will automatically group notifications with the same thread-id together. iOS 12 also offers a new Manage button for push notifications. When a user taps Manage, they can change whether notifications from your app are delivered prominently (with alerts/sounds/banners), or delivered quietly. They can also choose to turn off notifications from your app entirely - so it is more important than ever to make sure you are sending timely and useful push notifications to your users. Our Intelligent Delivery option can make it easier to send push notifications to your users at the most optimal time. Lastly, iOS 12 gives users Siri recommendations which will also prompt users by asking if they want to continue receiving notifications from your app, or to disable them. 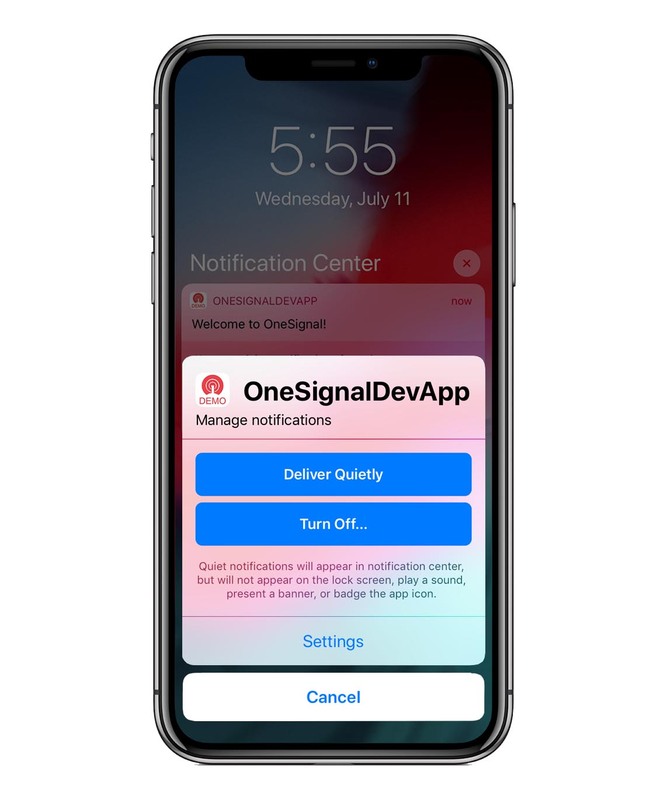 To install the iOS 12 OneSignal Beta SDK, you can follow this guide.